Doing nothing when the Muslims are rioting, but clamping down on Swedes when they try to defend themselves = “anti-racism” in a nutshell. It’s not anti-racism. It’s anti-white. Anti-racist is a code word for anti-white. That’s already understood. That’s why I wrote “anti-racism” between quotation marks. It may be already understood but it should still be said out loud at every appropriate opportunity. Multiculturalism means Sweden is for everyone but the Swedes. Once again a reminder that the powers-that-be will suppress ANY attempt by white people to organize or defend themselves, even if it’s against violence – never mind political activity! So Swedish politicians, engaged in the immigration & integration industry in their country, don’t try to hide their true objective. Not the creation of a “vibrant” multi-cultural society (in itself an impossible ideal), but nothing less than the dispossession (and ultimate genocide) of their own people is the goal. For this purpose any idea of cultural self-worth of the Swedish people has to be undermined. 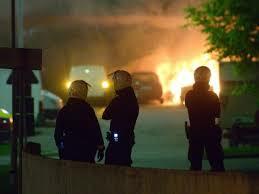 Swedish police, White Swedes themselves, betraying their own people, for a buck. I’m afraid this is exactly what we’re in store for here in the US when the sub-species goes wild. Our police, who are obviously, willing dupes for the jews, are going to do exactly what the jews order them to do, which is going to be “stand down” while immigrants and niggers kill and destroy, or round up Whites who dare to fight back. It’s funny how the author of this blogpost phrases himself considering that he’s apparently together with a jew and produced offspring with it, too. Yeah, it’s funny, Franz. He was open about it, filter as needed. Except you’re too stupid maybe to apply the necessary filter? I don’t doubt that being partly Swedish helps motivate my concern for what happens to Swedes. Yet because I’m only partly Swedish and married a non-Swede I can understand Swedes discounting what I have to say about anything. Or for that matter excluding my family utterly. I don’t doubt that being White helps motivate my concern for what happens to Whites. Yet because I’m married to someone who’s fathar was a jew I can understand Whites discounting what I have to say about anything. Or for that matter excluding my family utterly. They are not. Tan is not a jew and this blog isn’t about his family. onwatch, assuming for the moment that you’re not yet another expert at Talmudic taqqiyeh, you’re efforts would be better spent working among your own people to turn them away from their endless support and advancing of white genocide. The number of Jews who actually oppose white extermination are so small as to be statistically meaningless. Something more than just Jewish influence is at work in these four countries. So what? We’re concerned with the Jewish element. Waste of time when the short answer is all we need. Bogulyubski, quite correct except for, “… working among your own people to turn them away from their endless support and advancing of white genocide.” Time better spent on more fertile ground, i.e, Whites. I’ve seen the “reponse” among Jews (with only one exception–Bro Nathaniel). By the way, I assume you’re aware of who your famous name refers? A tragic hero of Kiev Rus? Since WW2 the entire West, including Europe, has been under the overarching hegemony of Jewry. That war has determined the course of events until the present. The response of the Swedish vigilantes, much like that of whites worldwide, gives lie to the idea that our decline is due to innate weakness of whites. The masses of people are willing to take action but they lack leadership because their nation states are no more than lapdogs of Jewry. The response of the Swedish vigilantes has been fairly mild-mannered. The mostly-white police, however, have been quite heavy-handed in beating the vigilantes while they let the ‘yoots’ run amok. The police need to become targets as they’ve already shown themselves to be traitors. Even more so for all politicians, magistrates, lawyers, media, academia and (most of all) the ruling elite they serve. Still, it beats rolling over and letting the elite and their jackboots stomp in their faces altogether. This is incredibly foolish. The police are controlled by the way the media filter the news. The media covers up anti-white crime and destroys the career of police who try to do anything about it. The primary root has always been usury and finance. The secondary root that developed in modern times is the media. The traitor political elite are the product of those two roots. Even in Sweden there is powerful jewish families that own the media like the Bonnier’s. Sort of. Like the host population’s level of immunity. Yes the usury/finance racket (same thing actually) is indeed the key to squid control. That’s beside the point however. Prosecutors, police and other whites who are willing to use force against those whites who are attempting to protect themselves from the third-world proxies of the treasonous and genocidal elite are themselves guilty of high treason. They should be therefore be targeted – with whatever force is needed. Those in the ranks of the media – the Ministry of Truth – are likewise treasonous and deserving of whatever fate befalls them. No quarter. No they shouldn’t as doing so would be spectacularly stupid. They’ve created a golem. The only part that should even be hypothetically considered as a target is the head: media, politics, financial donors etc. The double morality of Jews is a scale, not a duality. That is, in countries in which are many, like the USA, they are nearly as right-wing as in their own Israel. In the Netherlands, they are fewer than in the USA, so they are more left-wing. But the Netherlands has far more Jews than Norway, so Dutch Jews are more right-wing than Norwegian Jews, who are even willing to sacrifice Israel. This leads a kind of standard distribution. But… Israel is far more left-wing than China or Pakistan, so yes, there are other factors.